Box Text: The smash hit arcade game has been faithfully converted to the Dreamcast console, featuring an exclusive new city, bonus missions and hidden extras. Take control of one of four unique taxis and become the craziest driver by collecting passengers with attitude and delivering them to the various locations around the mind boggling expansive living breathing Cities. Remember drivers, careful, skilful driving increases your fares and ranking but get them there by any means possible! 05-05-2015 tpink Box Text The smash hit arcade game has been faithfully converted to the Dreamcast console, featuring an exclusive new city, bonus missions and hidden extras. 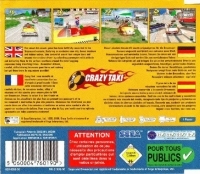 Take control of one of four unique taxis and become the craziest driver by collecting passengers with attitude and delivering them to the various locations around the mind boggling expansive living breathing Cities. Remember drivers, careful, skilful driving increases your fares and ranking but get them there by any means possible! 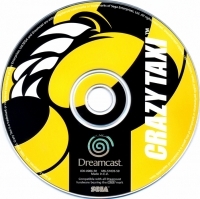 This is a list of VGCollect users who have Crazy Taxi in their Collection. This is a list of VGCollect users who have Crazy Taxi in their Sell List. 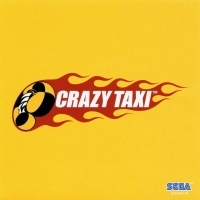 This is a list of VGCollect users who have Crazy Taxi in their Wish List.